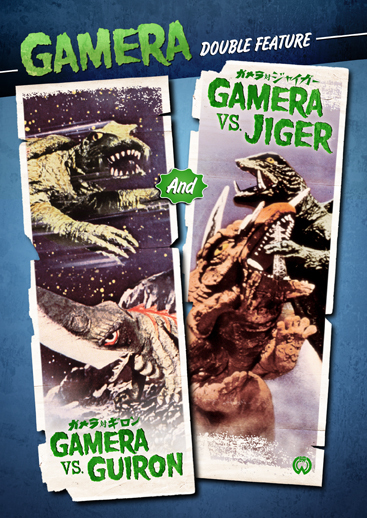 Digi-Schlock: GAMERA VS. GYAOS/GAMERA VS. VIRAS and GAMERA VS. GUIRON/GAMERA VS. JIGER (Shout! Factory DVD’s) – Schlockmania! Earlier this year, Shout! Factory began a reissue series of the original Daiei Gamera films. The initial two, Gamera The Giant Monster and Gamera Vs. Barugon, were a pleasant surprise for viewers accustomed to sketchy-looking grey market discs of these titles. Both featured careful remastering jobs and extremely informative commentary tracks by kaiju eiga historian August Ragone (who also assembled the other extras). The approach has shifted on the most recent pair of Shout! Factory Gamera discs. This time, extras have been cut back (alas, no commentaries) but fans are treated to two films on each disc: the first offers a pairing of Gamera Vs. Gyaos with Gamera Vs. Viras while the second combines Gamera Vs. Guiron with Gamera Vs. Jiger. To further sweeten the deal, these new discs also feature English dubs for the films – something that was missing in action on the company’s first Gamera releases. The transfer quality on both discs maintains the standard established by the first two Shout! Factory Gamera titles – all four films are presented in anamorphically enhanced widescreen transfers that make the most of the films’ colorful and sometimes surreal visuals. It’s worth noting that the films are presented in their uncut Japanese versions, which means that the footage cut from the American A.I.P.-T.V. release of Gamera Vs. Guiron is present on that disc. These discs also offer plenty of audio options. Each of the four films features the original Japanese mono soundtrack, complete with easy-to-read English subtitles. All films also feature the original A.I.P.-T.V. English dub tracks, with two – Gamera Vs. Gyaos and Gamera Vs. Guiron – including a second English dub. The second dubs are the notoriously lousy “Sandy Frank” dubs beloved to fans who first saw these films on Mystery Science Theater 3000. Each is good for a cheap laugh, with the Gamera Vs. Guiron dub being memorably awful. Sadly, extras have been cut down on to fit two films on each disc. There are no commentaries or liner notes to speak of this time but each film does a feature a “publicity gallery” that includes an array of stills and poster art. Thankfully, the quality of the transfers, the inclusion of dual language options and the value-for-money bonus of getting two films goes a long way towards making up for the scarcity of extras. 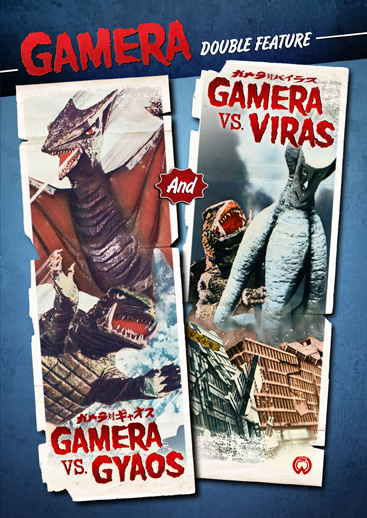 In short, these Gamera Vs. Gyaos/Gamera Vs. Viras and Gamera Vs. Guiron/Gamera Vs. Jiger double-bills offer solid value for money. If you’re a fan of the series, this is the best way to see them on U.S. dvd. Gamera is back, battling oversized monsters in the fifth and sixth movies in the Showa series of Gamera monster movies, Gamera vs. Gyaos and Gamera vs. Viras. Fortunately, for citizens of planet Earth, anyway, Gamera prevails, sending these terrifying creatures to their doom.Features two full-length Gamera films in their original Japanese versions, with English subtitles. Gamera is back, battling oversized monsters in the fifth and sixth movies in the Showa series of Gamera monster movies, Gamera vs. Guiron and Gamera vs. Jiger. Fortunately, for citizens of planet Earth, anyway, Gamera prevails, sending these terrifying creatures to their doom.Features two full-length Gamera films in their original Japanese versions, with English subtitles.